Poverty: A general scarcity of basic necessities of life is called poverty. The basic necessities include food, shelter, clothing, healthcare, sanitation, etc. Relative Poverty: This is a condition of inequality compared to the general population of the society. Some of the issues which are related to poverty are; Landlessness, Unemployment, Size of families, Illiteracy, Poor health/malnutrition, Child labour and Helplessness. Poverty as seen by social scientists: Income and level of consumption are the usual indicators of poverty. But many social scientists view poverty from many other parameters; like illiteracy, lack of general resistance due to malnutrition, lack of access to safe drinking water and sanitation, etc. Poverty also results in social exclusion of the affected population. A poor person is usually barred from enjoying certain basic pleasures of life which the people in the mainstream society are able to enjoy. Many people are not allowed to participate in various social functions because they are poor. In India, there has been a history of social exclusion on the basis of caste. People from the lower caste and dalit classes were excluded from the mainstream society mainly because they had been poor. Certain communities are more vulnerable to poverty than others. Data suggests that there is a larger percentage of poor among the Scheduled Castes and Scheduled Tribes. Minorities are also more vulnerable to poverty. Similarly, women, widow and handicapped are more vulnerable groups. When a person has the least capability of withstanding various challenged towards his economic relevance, he can be termed as vulnerable to poverty. Poverty line is usually defined on the basis of income or consumption. Different yardsticks are used in different countries to measure the poverty line. According to the World Bank, a person living on less than 1$ per day is considered to be living below the poverty line. This figure has been now raised to 1.25 $ per day. According to 2010 report by the World Bank, 32.7% of India’s population was living below the poverty line. As per 2000 figures; a family of five which is earning less than Rs. 1,640 per month is considered to be living below the poverty line. This figure is Rs. 2,270 per month for the urban area. The expected calorie intake has been fixed at 2400 calories per person in rural areas and 2100 calories in urban areas. A person consuming less than this amount is considered to be living below the poverty line. According to Development Goals Report of 2011, India is the only Asian country which is expected to half its number of poor people by 2015. The figure is expected to reach a level of about 22% of the population. This figure is expected to further go down to 20% by 2020. Although the percentage of poor living below the poverty line has declined, their absolute number has increased. The number of poor remained static at 320 million for a fairly long period. But this figure has also declined to 260 million in recent years. This graph shows the percentage of poor in different social groups in India. While the percentage of poor among average population is 26%; it is much higher among the vulenrable gropus. 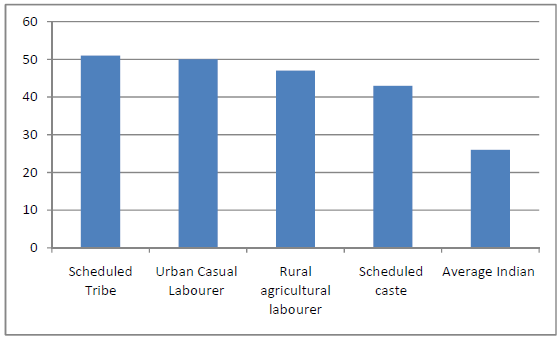 Scheduled Tribes, Scheduled Caste, Urban Casual Labourer and Rural Agricultural Labourer are the most vulnerable groups. Apart from the vulnerable social groups, different members in a poor family suffer in different ways. For example; women, children and elderly are the worst sufferers because of poverty. fferent members in a poor family suffer in different ways. For example; women, children and elderly are the worst sufferers because of poverty.